If you want to stop mildew and mold from growing in your shower; you need to get the air moving. I was taught by a nurse that mold will not grow in moving air. Get a small fan and set it outside your bathroom to blow air into your bathroom. Also open the shower door or pull back the shower curtain. This will help the shower to dry. After the walls dry you will need to close the shower curtain for it to dry. I like to bless my sweet darling by cleaning his shower for him once a month. Since we got the new Rubba Swishas, I like to use one on corners and floor. I don’t use the same one that I use on his toilet. That would just gross me out! Robert is really good about keeping his shower door open to allow it to dry. Kathy and Michele use our FlyLady Mop on their showers and bathtubs. They set the handle in its shortest position. You can use it wet to scrub the walls or dry to soak up the moisture. My favorite cleaner for my tub and shower is the same stuff I use on my hair and body. It will really work on the soap film it makes. Soap is soap! With my Rubba Swisha, Purple Rags, Rubba scrubba and our FlyLady mop; we keep our showers clean! Together my bathroom is company ready! I love how it blesses me! 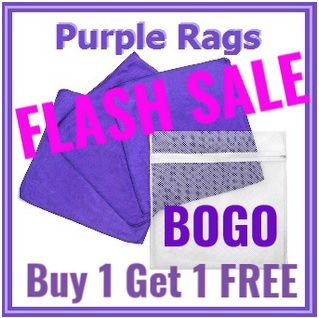 Last call for our Purple Rag BOGO! Buy one set get a set FREE! Use Coupon Code Time2Fly to save even more money! This entry was posted in Ask FlyLady and tagged ask flylady, bathroom, flylady, rubba swisha, zone 3. Bookmark the permalink.